Phil Hendicott and Ellie Barton of Australia decided to spend their wedding day with no clothes on, in front of their 250 guests. 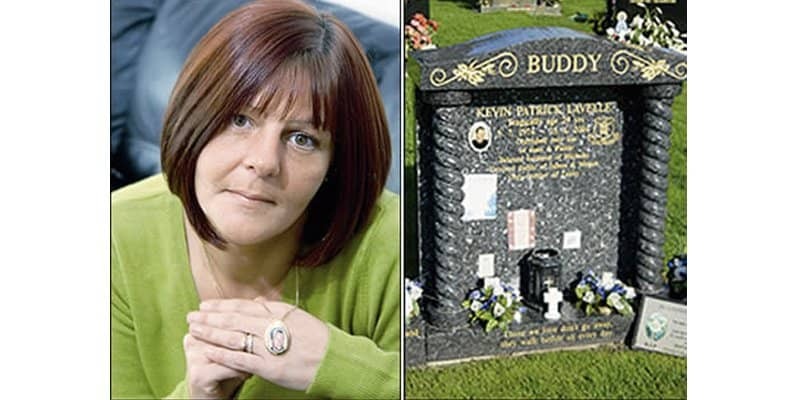 The two wore close to nothing but their wedding rings. Ellie wore a ‘painted on dress’, and a wedding veil, while Phil had nothing on except for a black top hat to cover his private parts. It was a happy-ever-after for bride Lisa Satayut. In an interview, Lisa explained that she is a self-confessed ‘Maxxinista’. TJ Maxx is her ‘happy place’–and thus decided to get married there. The bride and her groom Drew Ellis got married in the size 8 shoe aisle of the store with a strapless chiffon wedding dress, long gloves and gladiator sandals (which we guess are from TJ Maxx) Curious passers-by stopped bargain hunting to watch the momentous event. Mr. and Mrs. Curry from New York City got married inside a 120,000 gallon shark tank. The bride wore a white wetsuit and the groom wore black, and said their ‘I dos’ while circled by different types sharks and eels. 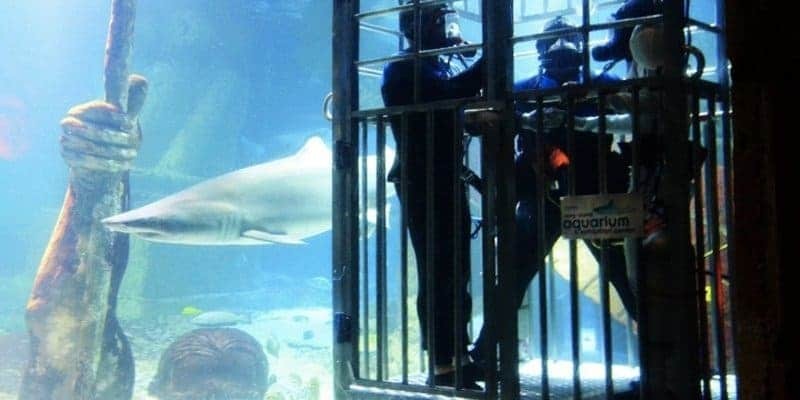 Both were experienced divers and had to broadcast their words to the officiant, friends, and family, none of whom did not have the equal nerve to get into the shark tank. 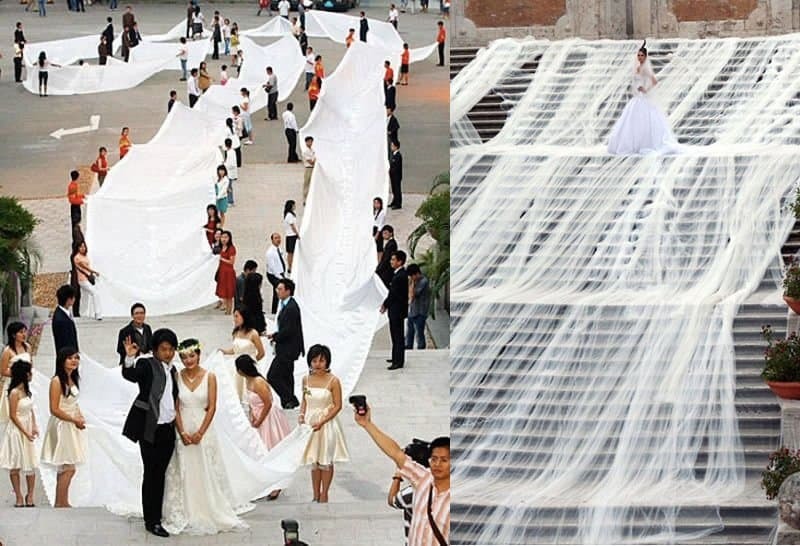 A Chinese bride from Guangzhou set the record for the world’s longest bridal train at over 600 feet! The train weighed 100 kilograms. Bride Xie Qiyun had her photos taken in front a hotel in Guangzhou, Guangdong Province for her special day. 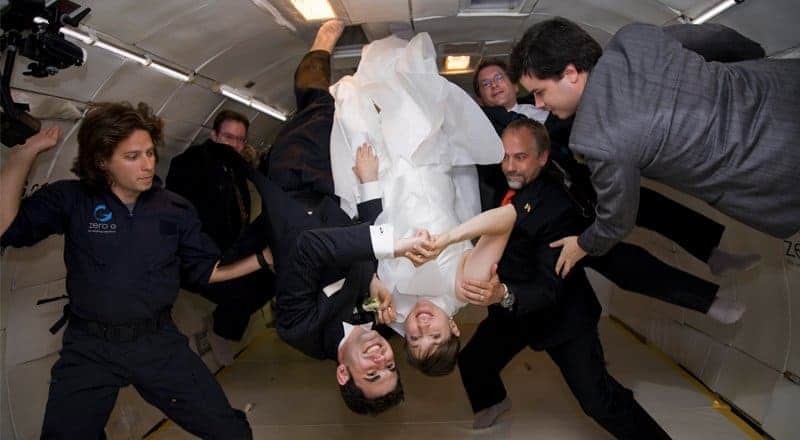 New York couple Erin and Noah Fulmor exchanged their ‘I dos’ in zero gravity on a Boeing 727-200 aircraft, which created a weightless environment for the wedding guests. Richard Garriott, an astronaut, officiated the ceremony. This couple are both bicycle lovers–they decided to get married in an unusual but active way–they rode in bicycles all over the city, accompanied by their fellow cycling wedding guests. Guinness World Records has a lot of zany records–one of them is for having the most bridesmaids in a wedding. 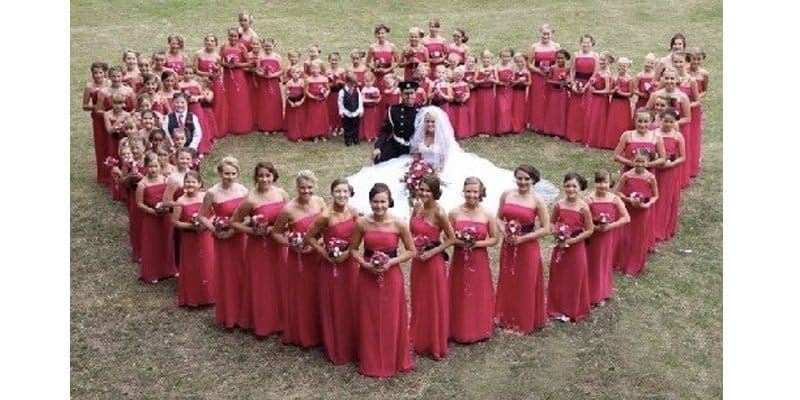 A bride from Ohio named Jill Stapleton, had 110 bridesmaids to walk with her down the aisle for her wedding. All her bridesmaids were her students to Jill’s Tumble World, a dance school that the bride owned. 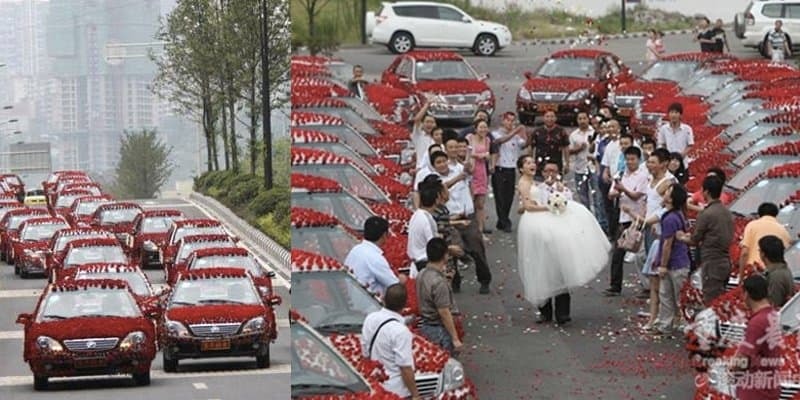 A groom from Central China is said to have saved a year’s salary to purchase 99,999 roses for his beloved bride, Xiao Liu for their wedding. In China, 999 is said to be a sign of good luck. The flowers were flown in from the other side of the country and required 30 cars to take all the roses to the service. 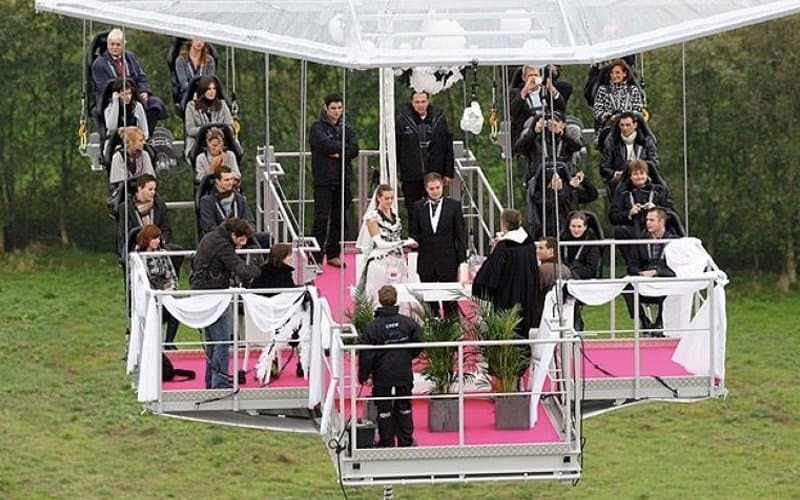 As if that wasn’t enough, the groom donated 20% of the cost of the flowers to charity for more good luck.